Just home from an epic hunt and I'm shattered, got my first pig, I'll do a write up tomorrow. Shootm, veitnamcam, Kiwi Greg and 18 others like this. 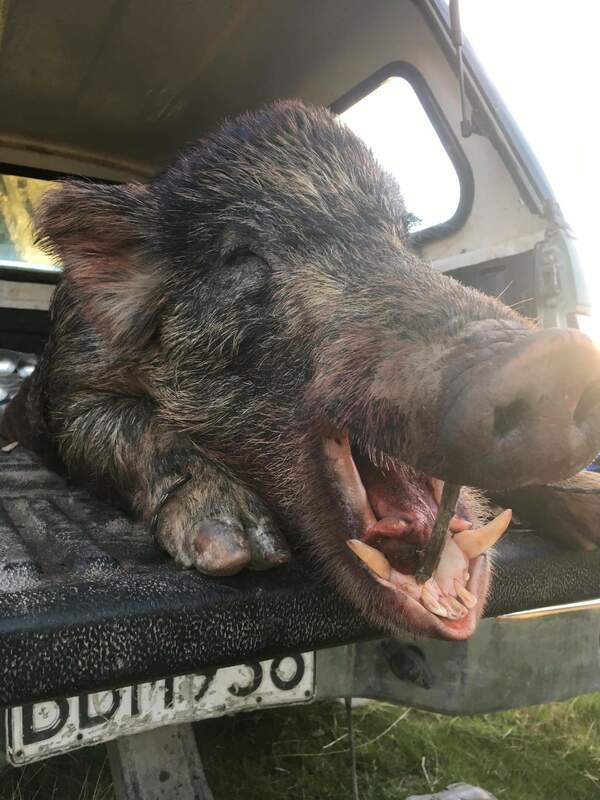 Mean bro, looks like a good boar and with that colour I’d say North Canterbury?...don’t say. nice grunter those front shoulders go well in a slow cooker if you haven't minced them with your cannon. Congratulations! What a great first Pig! Nailed him with the mighty 270 @150 yds perfect shot just behind the sholders, the shoulders are mint and won't be wasted. Bernie and oneshot like this. Well the day started out pretty ordinary, we had been out on a mates block up the Lees Valley a couple weeks ago but the wind had beeb all wrong and even though we had seen a few deer we couldn't get close enough to shoot the buggers. This day was similar and there was a bit of wind blowing in Oxford township so my hops weren't high as I was pretty sure by the time we hit the ridge lines in Lees Valley it would be blowing a gale at 1000m+. We had actually set out to target deer as mentioned earlier we had seen a few up there a couple weeks earlier. I never target pigs as I think the guys with dogs have a much better chance of success, also even though we knew there would likely be pigs up there my mate who has been on this block for a few years had never seen one. We got to our first ridge line at about 3pm probably to early for deer to be out feeding but as no one had been up on the block for a week we decided it was worth sitting there for a glass. Nearly an hour goes by and nothing other than a couple goats which weren't worth the effort as it would have been a huge mission to get them where they were. The valley we were glassing was kind of an "L" shape and we couldn't see one end so we decided we were going to head up to where we had seen a few deer before as we wanted to be there when the deer started to feed. As we rounded the corner of the valley we decided to stop for a quick 10min glass of the bit of the "L" we couldn't see from our first possie. Just as we were about to head off again I was literally about to say to my mate it's funny there's no pig rooting on this face it loogs like prime pig country, he pipes up and says "pig"
Sure enough at the bottom of the gut crossing a slip theres a pig just meandering around was hard to tell how big as they often look bigger through the binos than they really are. We ranged him at 540 yds a bit far for an ethical shot for me. We boosted it to grabed our gear out the truck and once sighting the pig agsin made our way down into the gut to just above the scrub line. The gut was not far off vertical in places and I knew we were in for a hard slog out. The thing with guts is that they rarely provide a good flat shooting platform, we gound a rocky outcrop and even though it was sloping down hill and my left leg was hanging in the breeze it was good enough with the pack propped up in front of me. Mr pig was rooting around under a fern bush having a good old feed and I could literally only see his back legs and tail swishing around, so we waited, he wasn't going anywhere and if he did he would have to break cover to do it as the ferns he was under were in the middle of the slip.....we waited some more and more and this pig was having a field day dirt and rocks flying out from under the fern scrub and the pig disappeared from sight a few times but by the way the fern scrub was thrashing about therecwas no doubt hecwas in there. After about 1 hour I was really starting to suffer from positional fatigue on my uncomfortable sloping rock ledge perch. Even after a few stretches getting back into position my body would just start spasming and cramping almost immediately.